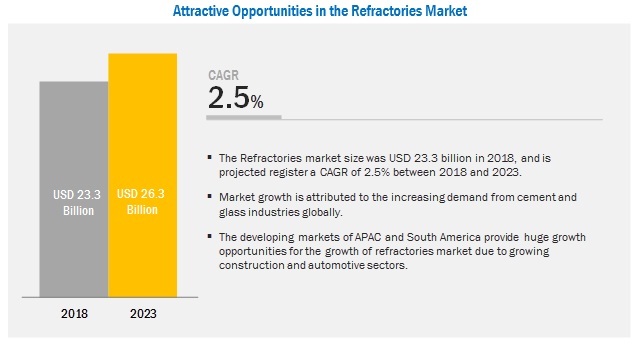 [157 Pages Report] The global refractories market is estimated to be USD 23.3 billion in 2018 and is projected to reach USD 26.3 billion by 2023, at a CAGR of 2.5%. The growth of the iron & steel, glass, non-ferrous, and power generation industries is expected to drive the market growth. By form, the unshaped refractories segment is expected to be the larger contributor to the market growth during the forecast period. The growth of the segment is mainly attributed to the demand from the cement, glass, and ceramic industries. Unshaped refractories are mostly preferred by manufacturers than shaped refractories. These are widely used by manufacturers as the unshaped refractories are easy to use and have applications in various end-use industries. The growing glass and ceramic industries are expected to drive the market for acidic & neutral refractories during the forecast period. The growth of the segment is mainly attributed to the high usage in cement, glass, and ceramic industry. Both acidic & neutral and basic refractories have their largest market in APAC due to increase in infrastructural developments to keep pace with the mounting industrialization taking place in the region. Basic refractories are more widely used owing to their high resistance to corrosive reactions with chemically basic slags, dust, and fumes at elevated temperatures. APAC is estimated to be the largest market during the forecast period. The growth of the market in APAC is mainly driven by the increasing production and R&D facilities in this region. China, India, and Japan are the major contributors to the growth of iron & steel, glass, and non-ferrous metals industries in the region. These industries are witnessing growth owing to the increasing per capita expenditure and growing urbanization. This is further expected to create a demand for refractories in the region. Companies such as RHI Magnesita N.V. (Austria), Vesuvius PLC (UK), Krosaki Harima Corporation (Japan), Shinagawa Refractories Co. Ltd. (Japan), Saint-Gobain S.A. (France), Corning Incorporated (US), Morgan Advanced Materials PLC (UK), CoorsTek Incorporated (US), HarbisonWalker International (US), Imerys SA (France), and Chosun Refractories Co. Ltd. (South Korea) are the leading players in the refractories market. Diversified product portfolio, high depth in application reach, and technical assistance to customers are the factors responsible for strengthening the position of these companies in the refractories market. 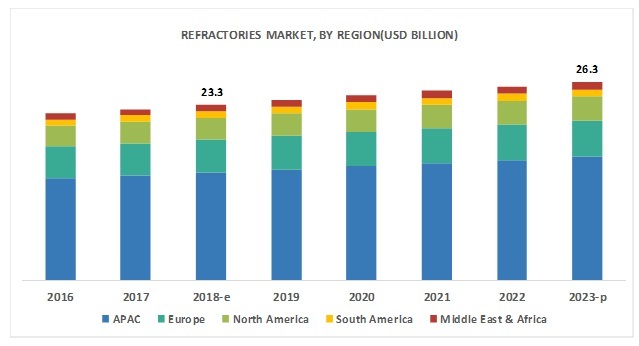 They have also been adopting various organic and inorganic growth strategies such as mergers & acquisitions, new product developments, and expansions, to enhance their current position in the refractories market. In July 2018, Vesuvius, under its brand Foseco, launched its new product, namely, Novel SCK. This product is specifically dedicated for use in iron & steel foundries. In June 2018, Vesuvius, under its brand Foseco, launched its new product, namely, TRIAD Z-189. This material is specifically formulated to cope with the demanding applications in cupola furnace melting. In November 2017, RHI AG (Austria) and Magnesita Refractories S.A. (Brazil) merged their businesses to create RHI Magnesita N.V. This merger was aimed at widening the product portfolio and customer base. In October 2017, RHI Magnesita acquired Agellis Group AB (Sweden), which is specialized in advanced electromagnetic detection systems as well as Infra-Red (IR) technology. This acquisition was a part of RHI Magnesita’s strategy to increase its product portfolio. What are the future revenue pockets in the refractories market? 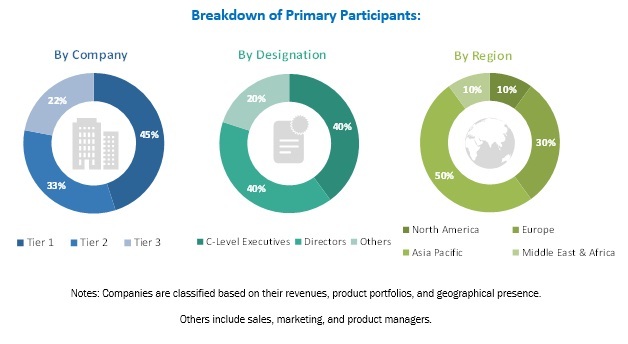 Which are the key developments expected to have a long-term impact on the refractories market? Which are the product technologies expected to cannibalize existing technologies? How is the current regulatory framework expected to impact the market? What will be the future product mix of the refractories market? What are the prime strategies of leaders in the refractories market? 11.12.15 Liaoning Qinghua Refractories Co. Ltd. The study involved four major activities in estimating the current market size for refractories. Exhaustive secondary research was done to collect information on the market, peer markets, and parent market. The next step was to validate these findings, assumptions, and sizing with industry experts across the value chain through primary research. Both top-down and bottom-up approaches were employed to estimate the complete market size. Thereafter, the market breakdown and data triangulation procedures were used to estimate the market size of segments and subsegments. In the secondary research process, various secondary sources such as Hoovers, Bloomberg BusinessWeek, and Dun & Bradstreet were referred to for identifying and collecting information for this study. Secondary sources included annual reports, press releases & investor presentations of companies, whitepapers, certified publications, articles by recognized authors, gold standard & silver standard websites, associations, regulatory bodies, trade directories, and databases. After arriving at the overall market size-using the market size estimation process explained above—the market was split into several segments and subsegments. In order to complete the overall market engineering process and arrive at the exact statistics of each market segment and subsegment, the data triangulation and market breakdown procedures were employed, wherever applicable. The data was triangulated by studying various factors and trends from both demand and supply sides. This report categorizes the refractories market based on form, alkalinity, end-use industry, and region.